The beautiful artificial Anasagar Lake, located to the north of the Ajmer city, was made in 12th century by building a dam across the river Luni, named after the then ruler Anaji Chauhan. This lake was built by Anaji during 1135-1150 AD. 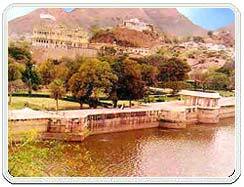 Ana Sagar Lake - Another significant lake formed by the efforts of man in Rajasthan. The lake is surrounded by beautiful parks and marble pavilions. Right in the middle of the lake is an island which can be reached by a motor boat. The ride, of course, is as enjoyable as a walk on the good-looking bank.